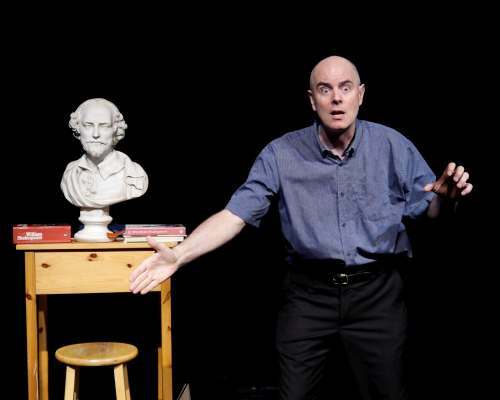 Doctor Keir Co.’s production of Shakespeare Crackpot at the Toronto Fringe Festival was an entertaining and thought-provoking scamper through the history of Shakespeare. Bolstered by stories of Keir Cutler’s personal experience with academia, it emphasized the importance of thinking for yourself. If you’re interested in both Shakespeare and academia, as I am, there is certainly something here for you. Cutler played two roles- he earned peals of laughter from the audience during his scenes as Doctor Keir, a composite parody version of Cutler’s own professors, but most of the time he played himself. Thanks to lighting design, basic costume, and Cutler’s physicality, these two characters were easily distinguishable from each other. Cutler called for audience participation on several occasions, mostly of the “Can anyone tell me what happened in 1623?” variety. Shakespeare buffs will surely love this kind of participation; one audience member received a round of applause when he identified 1623 as the year Shakespeare’s First Folio was published. However, a PhD in Renaissance Literature was not required, and the audience participation never put anybody on the spot. Couched in history and humour, Shakespeare Crackpot was also a quietly radical critique of the ossification of critical thought surrounding Shakespeare. Cutler dared to point out that various institutions benefit from maintaining their quasi-religious worship of the Bard. Academia is among them; so are huge swaths of the tourism industry, and any theatre company with a distinguished reputation for performing Shakespeare’s works. Although Cutler offered insightful criticism, his style was always funny and friendly, never confrontational. Whatever your own stance on the authorship of Shakespeare’s plays, it is hard to argue with Cutler’s basic assertion: people should be encouraged to think for themselves. I need to do further research before I can decide whether to join the Shakespeare doubters myself, but that’s surely the point. I too believe that students should be given the chance to openly and freely investigate the Shakespeare authorship question. As a graduate student in English Literature, I know that academia does not always welcome people challenging ideas. With charisma and humour, Shakespeare Crackpot drags one of academia’s most suppressed discussions out into the air. And we are all, surely, the better for it. “Shakespeare Crackpot by Keir Cutler a well seasoned and competent writer and Fringe performer provided a challenging and thought provoking hour for the audience.The material and performance fell a little short of the description-‘insightfully hilarious’.That description is misleading- he is amusing, but not hilarious. Another patron commented after last night’s performance that she found the history of Cutler’s up-bringing and family history quite intriguing- as did I. It is definitely a show to see if you are a fan of Shakespeare, a person in academia (past or present) and/or someone wanting a very thoughtful and challenging literary experience from the Fringe. The production was directed by T.J. Dawe – another terrific Fringe contributor.